Located in Upper Egypt, at the head of one of the world's most sizeable dams, Aswan is today a popular resort and tourist destination. Early Aswan history is quite impressive, with this settlement being a centre for the ancient Egyptians and Ptolemies, while many Egyptian monuments acquired their granite from local quarries. People also use this city as a stepping-stone to visit Ramesses' temples of Abu Simbel. 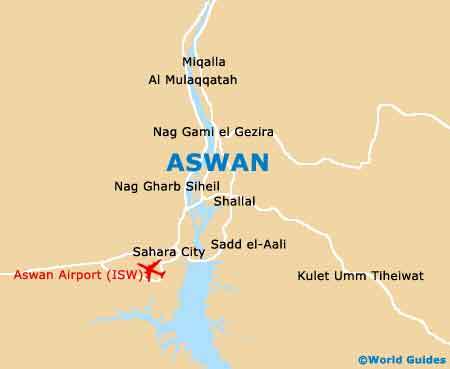 Known as Swen, or Swenet - from the Egyptian goddess, ancient Aswan functioned as the gateway to Nubia (southern Egypt / northern Sudan, around the River Nile), which is today mostly buried beneath Lake Nasser. The early title is also said to mean 'trade', from the ancient 'El Souan' settlement, since Aswan served as something of a centre for the ancient Egyptians as the capital of Upper Egypt. Amongst the main hubs were the nearby Elephantine Islands, then Yeb (Nubian for elephant), where a fort of the same name was based (around 1600 BC). It marked Egypt's southern boundary. These islands were heavily involved in the world of trading, with gold, ivory and even camels being sent out Egypt-wide. Elephantine is loaded with sights today, and not far from the city, being located in the Nile River and below the dams. The tombs of Aswan are also a major draw, residing on the West Bank (north of Kitchener's Island) and hailing from the Old and Middle Kingdoms, around 2000 BC. The ancient rulers built a Necropolis and scattered it with tombs to house various nobles - governors, dignitaries and gate keepers (Gate of the South). Half a dozen of these tombs are open to visitors today, offering more of an insight into ancient burials than the more touristy Valley of the Kings tombs in Luxor. They include Al-Hawwa's Tomb - a Muslim prophet, Mohammed Shah's Tomb - of more recent Aswan history, and various other Egyptians lower down. The Ptolemies ruled the land from 323-30 BC, using it as a base to explore Nubia and the central regions. The standout reminder of their time in the history of Aswan is the immaculate Temple of Philae, dedicated to goddess Isis. 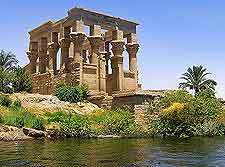 The temple is now sited on Agilkia Island, since it was moved here by UNESCO after the building of the Aswan Dam. Among everything else, Aswan history includes its vast fields of Syenite granite, quarried for the wealth of shrines and monuments around the country, including many pyramids. These ancient quarries still reside on the Nile banks and you can see markings of the quarrymen's' work, such as the Unfinished Obelisk. Aswan was used as a garrison for successive dynasties in ancient Egypt. Tolls were collected from passing boats and a bishop from Alexandria was received (330 AD), making it the Coptic Diocese of Syene. The later ruins of St. Simeon's Monastery hail from the 7th century AD. Of note, the military connection extended into the 19th century, when British general Horatio Kitchener led an army against the Sudanese Mahdi. The dam was completed way back in 1902 under the British, being today known as the Lower Dam. It was built to irrigate farmland and prevent flooding. The dam was later topped due to rising waters and rather than top it again, it was decided to build another, farther upstream. The High Dam was thus built, in the 1960s, and has aided Aswan historically and Egypt economically, including power generation. 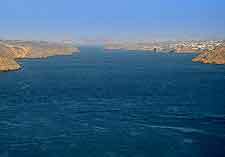 Lake Nasser is the by-product and was at the time the world's biggest dam - stretching all the way to the Sudanese border. It did, however, submerge several important historic sites. The temples of Abu Simbel were fortunately saved from the flooding, being successfully relocated to an island in the lake. 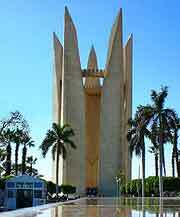 All the same, this incredible feat of engineering is a source of enormous pride for Egyptian nationalism.